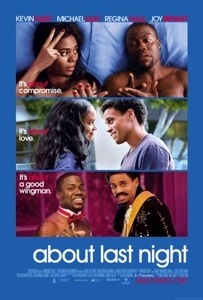 Kevin Hart | HarlemGal Inc.
See the remake for free of About Last Night in Harlem, January 9th, at Magic Johnson Theater on 125th Street. Get tickets here. This contemporary version closely follows new love for two couples as they journey from the bar to the bedroom and are eventually put to the test in the real world. The all-star cast includes: Kevin Hart (Think Like A Man, upcoming Ride Along), Regina Hall (Best Man Holiday), Michael Ealy (Think Like A Man, TV’s Almost Human), Joy Bryant (TV’s Parenthood) and is directed by Steve Pink (Hot Tub Time Machine, Accepted).